The world’s most mysterious, and expensive, hole in the ground has been ceremonially opened by the Russian Foreign and Trade Ministers, Sergei Lavrov and Denis Manturov. At least that’s what they say they did a month ago in Harare, the capital of Zimbabwe. The President of Zimbabwe, Robert Mugabe (lead image, centre), also presided. The hole to be dug is to cost the Russian state budget and banking system at least $600 million, rising to $3 billion in three years; and then $4.8 billion by 2024 when mine, ore-processing plant and refinery are fully operational. That’s according to the Zimbabwe press announcements. They have also disclosed the list of Russian and Zimbabwean partners in the deal. Calling themselves Afromet, the Russians are Vitaly Mashitsky (lead image, left), Sergei Chemezov (right), and Vnesheconombank (VEB) represented by Alexander Ivanov, son of the presidential chief of staff, Sergei Ivanov. The Zimbabweans are calling themselves Pen East Investments. Together, they have picked the name Great Dyke Investments. There’s a catch: no Russian involved in what is billed as the Darwendale platinum project wants to admit what he is doing; what protection from loss has been installed by the Kremlin for the money; and why a new platinum mine in east Africa can be a profitable way of spending Russian state money when the country’s platinum miners, Norilsk Nickel and Russian Platinum, say they wouldn’t touch the project with a barge-pole. On September 16, the officials involved posed for pictures to confirm the appearance of the deal. Below left, Lavrov holds hands with Mugabe, while Manturov covers Lavrov’s back. Below right, Manturov holds hands while Lavrov covers Manturov’s back. Lavrov has had considerable experience protecting Russian corporate interests in west Africa, where he has intervened in the Republic of Guinea and in Nigeria on behalf of Oleg Deripaska’s United Company Rusal. Lavrov’s interventions have been unsuccessful. The Zimbabweans in the picture are Foreign Minister Simbarashe Mumbengegwi (2nd from right) and Mines Minister Walter Chidhakwa (far right). Pen East Investments, the Zimbabwean licence holder for the Darwendale platinum prospect, is reported in the Zimbabwean press to be shy of having its picture taken because it is linked to the Zimbabwean military, some retired, some serving line officers, some intelligence figures. 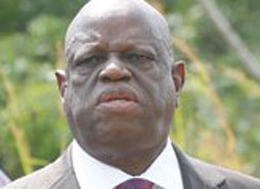 Reportedly, its board is chaired by Colonel Tshinga Dube (right), who is also the chair of Marange Resources, a controversial diamond miner, and head of Zimbabwe Defence Industries (ZDI). Another director of Pen East is Caroline Sandura, a former board member of the state mining development company, ZMDC. For speculation on who is also counted on the shy Zimbabwean side, read this. 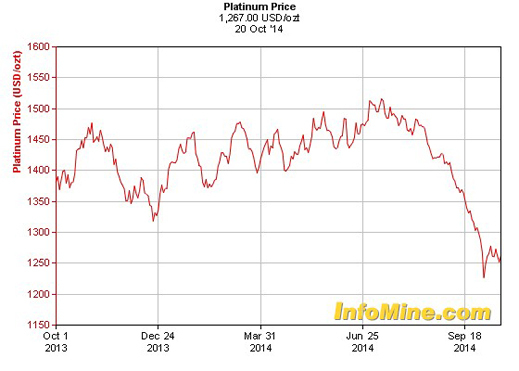 Just how risky new platinum mines are can be gauged from the plummeting chart of the platinum price in world markets. According to reporting by Michael Kavanagh of Noah Capital in Johannesburg, platinum’s price will continue downward for the foreseeable future. That’s because Kavanagh believes, as does the trade, that there is too much platinum in off-market stocks for increasing industrial or jewellery demand, cuts in supply from the South African mine strikes, or cartel-type manipulation, to counteract the surplus in the shadows. Much of the platinum surplus is beyond government control, contained as scrap in platinum-bearing automotive catalysts waiting to be recycled. For more, read this. Another way of confirming the negative market sentiment is to look at the year’s share price movements for the world’s largest platinum miners outside Russia. Anglo Platinum, with a current market capitalization of $9 billion, is down 32% from its year high. Impala Platinum, at $4.8 billion, is down 35%; and Lonmin, at $1.5 billion, is down 45%. Zimplats, an associate company in the Impala group with a separate Australian listing, is the exception: its share price has been moving upwards this year by 23%, and is currently close to its year-to-date peak. Its market cap is A$942 million. Notwithstanding, outside Russia the commodity and share price trajectories make new platinum mines unbankable. At Russian Platinum, which has yet to develop its first platinum mine in northwest Russia, a source said investment in Darwendale had never been considered. According to Canadian and other mine market sources, global production of platinum is expected to shrink over the next few years as the falling price of the metal puts most South African mines into lossmaking. At current platinum prices, about 45% of South Africa’s platinum mines are operating at a loss, and up to 2 million ounces of annual output may be disappear as mines are closed. That represents about one-third of the 5.56 million oz to be produced in 2014. Platinum is mined along the Great Dyke, principally by Anglo Platinum, Impala, Zimplats, and some smaller miners. Note that not a word is mentioned about Russian state bank financing for the Darwendale project in which the Russian partners have no experience of mining platinum. Vitaly Mashitsky is one of the Russian stakeholders in the project through a private entity called Vi Holding. Mashitsky’s principal business is the Dutch-registered, London-listed Vimetco, which operates a small bauxite mine in Sierra Leone, and processes the bauxite into alumina and aluminium in Romania. It also operates an aluminium business in China. The Vi in both company names represents Mashitsky’s first name. The Vi Holding website is non-operational; it is reported in the Russian press to hold real estate assets. Vimetco does not reply to questions for the Irkutsk-educated Mashitsky, who also holds Israeli citizenship. Mashitsky’s business history appears to start with Marc Rich, the commodities trader, who used another eponymous company called Marco and a protégé called Alan Kestenbaum to obtain a Romanian aluminium production chain by low-priced privatizations. Mashitsky then “crossed swords” with Kestenbaum, according to the latter’s lawyer, and Kestenbaum ended up without the assets he thought he owned, and threatening Mashitsky with litigation. Alexander Krasner, another of Rich’s, Mashitsky’s and Kestenbaum’s business partners in Romania, ended up the same way. Mashitsky appears to have bought the rights to Darwendale from Alexander Chepik, (right) a group of his friends called the Centre for Business Cooperation with Foreign Countries, and a Zimbabwe company titled Ruschrome. That deal was reported in the spring of 2013. How much (or if) Mashitsky paid for the stake he refuses to say. What balance of shareholding Chepik continues to have in the Darwendale project Mashitsky also refuses to disclose. 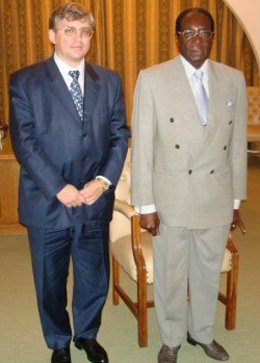 Chepik, a Montenegrin educated in Moscow, has been another Russian handholder of Mugabe. Chepik sharedseats on the Ruschrome board with Zimbabwean military figures, including Colonel Dube. For Chepik’s selfie in the Moscow Times, click here. The Zimbabweans are reported to believe that when Chepik transferred his stake in Darwendale to Mashitsky, Russian cash would start to flow into the venture, and into the pockets of the Zimbabwean stakeholders. But Mashitsky hasn’t the cash. What is known from public shareholding and financial reports is that Vimetco is running at a loss of $115 million in the first half of 2014. In 2013 it reported a bottom-line loss of $150.4 million. Liabilities and debts as of last December 31 came to $4.6 billion. Vimetco’s current market capitalization is just $65.8 million. Mashitsky is reported in the Russian press to be an old friend of Chemezov, the state-appointed controller of the Russian Technologies conglomerate (Rostec, Rostek) which, in turn, controls the Russian arms export agency, Rosoboronexport. For more on Mashitsky’s friends in Russian state companies, read this. For the cash required to turn Darwendale into a platinum mine, Mashitsky applied to Chemezov, and he turned to Ivanov at VEB. Chemezov’s connexions to the Kremlin have landed him on the Ukraine sanctions lists of the US and the European Union; Ivanov’s father, too. Their business in Harare has reportedly attracted lobbying by the US government to stop Mugabe going ahead with the platinum project. Since Mugabe is sanctioned himself, he is unpersuaded. The US Embassy in Harare has issued this denial. 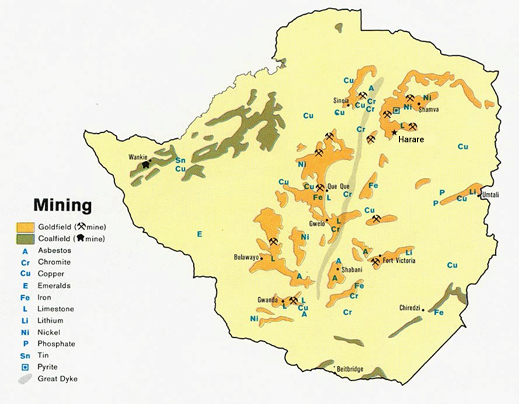 Kavanagh of Noah Capital concedes that “inherently the Great Dyke in Zimbabwe is an attractive place to mine. It is shallow and mechanised, something the deep-level narrow reefers in South Africa would love to have. However, even those that do have, such as Implats are not investing in Zimbabwe, preferring to let the operations self-fund from operating cash flow.” The reason is political risk, both before Mugabe dies and afterwards, when the Zimbabwean army, the security services, and other hopefuls start fighting for the succession. What if the Russians calculate they aren’t running much of a political risk because Mugabe and the army are both in the Darwendale deal? What if the Russian calculation is that not much cash is actually exposed to the risk of Zimbabwean expropriation or fraud because the cash, once paid over, must come back in the form of payments the Zimbabwean defence ministry, army and airforce will make to buy Russian arms? According to Trade Minister Manturov last month in Harare, that is exactly what is happening in the Darwendale deal. “Russia would also like to supply military hardware, helicopters and trucks to Zimbabwe, Manturov told reporters, Manturov was asked to confirm that he wasn’t misquoted; that he did say exactly this. Yes, he said, he did. Manturov implied much more. This is if the estimated financial requirements of the three stages of the Darwendale project — $600 million, then $3 billion, and finally $4.8 billion – are planned to match the arms deliveries to Zimbabwe, with VEB to finance the cash flowing in both directions. A production target of 300,000 ounces of platinum by the years 2017-2018 – announced in the Zimbabwean press — would realize less than $400 million in sales at today’s platinum price. So even allowing for Darwendale to start funding mine expansion itself through sales of platinum, the financial scale is far beyond both Mashitsky’s and Chemezov’s means. VEB is thus the lynchpin of the project. The bank was asked to clarify what feasibility study has been done, what funding has been approved – how much for the Darwendale mine, how much for the arms trade. The bank refused all comment. Kuznetsov for Rostec claims that Manturov didn’t link the Darwendale project to Russian arms sales. “Can we see this [Trade Ministry] confirmation? The text that you sent us does not contain Manturov’s quote, but only what he was reported as saying. 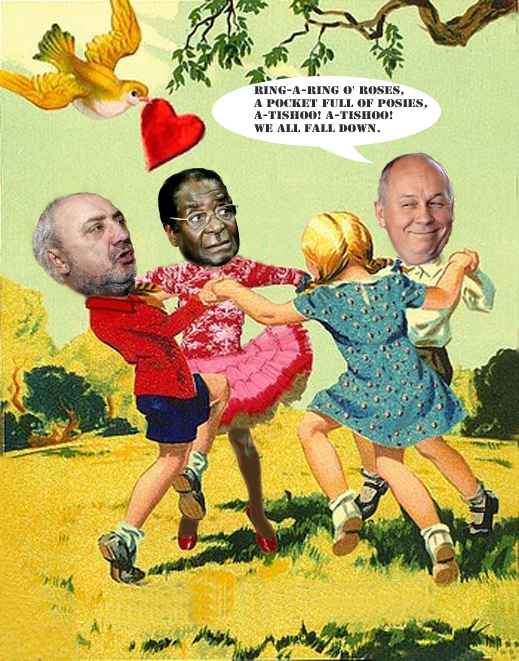 It could be a trivial translation error, or it could be taken out of context.” According to Rostec, the Trade Ministry denies confirming what Manturov said in Zimbabwe. Why then is Rostec thinking of developing such a mining project abroad when it has failed to develop the Udokan copper deposit in Russia and has been forced to ask the Chinese for money for that project instead?